Let me tell you a story of a one poorly knitted item of clothing! 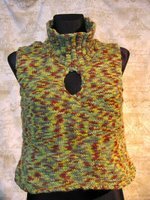 This vest was my first item knitted. 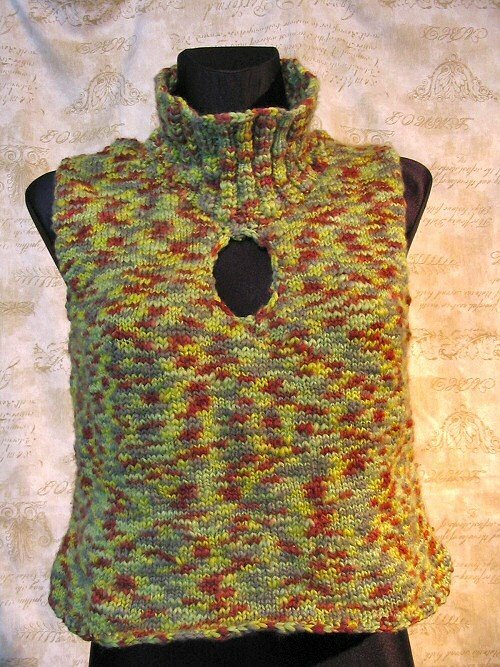 So, this green-brown vest was the first thing I ever knitted myself. What's more, one would choose some easy to knit yarn, with even surface and even thickness throughout the whole skein - but not me, of course again! I saw this fuzzy, thicker-thinner mixed coloured yarn in a shop and bought it immediately for my first knitting project! On the label of a yarn I read "needles size 4", so I took 4s and WITHOUT SWATCHING I started my project. (swatching is for sissies, I thought!...) And it turned out that I was a tight knitter and I should have taken 5s or 6s, because the final result was a dense fabric. It doesn't look that bad, but it could be a bit looser and I would have some more yarn left (I finished 4 skeins till the last cm! That's why my sweater ended up as a vest...). I started without the rib, so the stockinette curls up like crazy. I even wanted to add the ribbing after I'd finish the vest, but I knitted up all the yarn supplies I had, (and I bought 4 last skeins on sale, so I couldn't just go and buy some more). Shoulder slants are too steep, because it was done totally intuitively - you shouldn't do that! There is no waist line accented, I just knitted staight line all the way up. The front looks a bit different than the back. Why? Because while making the back I was purling the normal way, but then my mother showed me purling through the back loop and she said that's the easier way to purl (she didn't know the difference between 'p' and 'p tbl' and 'k' and 'k tbl', how on earth did she knit all those years?!... ), so I used this stitch on the front. With all those bad points, it's surprisingly nice and comfortable, and I wore it last Winter very often! ^^ But don't try this at home! I read about the idea of "I'm fit and I knit" on Kimberly's blog today and I decided to grab the button and put it on my blog immediately! Years ago (no, no, don't ask) I took belly-dancing in Southren California. It was the most fun I ever had earning the right to eat chocolate! Have fun, keep going, dance for your hubby! Yeah!! We're in this together. By the way, I love that sweater! That sweater looks pretty good for a first project! I started with a triangular shawl, which is a bit more interesting than a scarf but not as complicated as what you picked. It is funny to laugh at those early knitting mistakes (OK, and current knitting mistakes too). I was never atheltic either, and also a miracle I am still fairly thin! I would love to take dance classes but I live in a very small town where they just aren't available. I think I need to check out that FAL (Fit along? ).